Don Miguel de Cervantes y Saavedra September 29, 1547 – April 23, 1616) was a Spanish novelist, poet, and playwright, best-known as writer of Don Quixote. Cervantes' novel Don Quixote has had a tremendous influence on the development of prose fiction. It has been translated into all major languages and has appeared in 700 editions. The first translation was in English, made by Thomas Shelton in 1608, but not published until 1612. Shakespeare had evidently read Don Quixote, but it is most unlikely that Cervantes had ever heard of Shakespeare. Carlos Fuentes raised the possibility that Cervantes and Shakespeare were the same person (see Shakespearean authorship question). Francis Carr has suggested that Francis Bacon wrote Shakespeare's plays and Don Quixote. Don Quixote has been the subject of a variety of works in other fields of art, including operas by the Italian composer Giovanni Paisiello, the French Jules Massenet, and the Spanish Manuel de Falla, a Russian ballet by the Russian-German composer Ludwig Minkus, a tone poem by the German composer Richard Strauss, a German film (1933) directed by G. W. Pabst, a Soviet film (1957) directed by Grigori Kozintsev, a 1965 ballet (no relation to the one by Minkus) with choreography by George Balanchine, and the American musical Man of La Mancha (1965), made into a film in 1972, directed by Arthur Hiller. 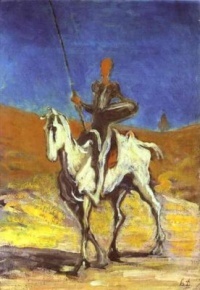 Don Quixote 's influence can be seen in the work of Smollett, Defoe, Fielding, and Sterne, as well as in the classic 19th-century novelists Scott, Dickens, Flaubert, Melville, and Dostoevsky, and in the works of James Joyce and Jorge Luis Borges. The theme of the novel also inspired the 19th-century French artists Honoré Daumier and Gustave Doré. The Euro coins of €0.10, €0.20, and €0.50 made for Spain bear the portrait and signature of Cervantes. El Ingenioso Hidalgo Don Quijote de la Mancha (1605): First volume of Don Quixote. Segunda Parte del Ingenioso Hidalgo Don Quijote de la Mancha (1615): Second volume of Don Quixote. La Galatea, the pastoral romance, which Cervantes wrote in his youth, is an imitation of the Diana of Jorge de Montemayor and bears an even closer resemblance to Gil Polo's continuation of that romance. Next to Don Quixote and the Novelas Ejemplares, it is particularly worthy of attention, as it manifests in a striking way the poetic direction in which the genius of Cervantes moved even at an early period of life. Don Quixote (spelled "Quijote" in modern Spanish) is two separate volumes now nearly always published as one, that cover the adventures of Don Quixote, also known as the knight or man of La Mancha, a hero who carries his enthusiasm and self-deception to unintentional and comic ends. On one level, Don Quixote works as a satire of the romances of chivalry, which, though still popular in Cervantes' time, had become an object of ridicule among more demanding critics. The choice of a madman as hero also served a critical purpose, for it was "the impression of ill-being or 'in-sanity,' rather than a finding of dementia or psychosis in clinical terms, that defined the madman for Cervantes and his contemporaries." Indeed, the concept of madness was "associated with physical or moral displacement, as may be seen in the literal and figurative sense of the adjectives eccentric, extravagant, deviant, aberrant, etc." The novel also allows Cervantes to illuminate various aspects of human nature. Because the novel, particularly the first part, was written in individually published sections, the composition includes several incongruities. Cervantes himself however pointed out some of these errors in the preface to the second part; but he disdained to correct them, because he conceived that they had been too severely condemned by his critics. Cervantes felt a passion for the vivid painting of character. Don Quixote is noble-minded, an enthusiastic admirer of everything good and great, yet having all these fine qualities accidentally blended with a relative kind of madness. He is paired with a character of opposite qualities, Sancho Panza, a man of low self-esteem, who is a compound of grossness and simplicity. It would be scarcely possible to arrange the other works of Cervantes according to a critical judgment of their importance, for the merits of some consist in the admirable finish of the whole, while others exhibit the impress of genius in the invention, or some other individual feature. A distinguished place belongs to the Novelas ejemplares ("Moral or Instructive Tales"). They are unequal in merit as well as in character. Cervantes doubtless intended that they should be to Spanish nearly what the novellas of Boccaccio were to Italians. Some are mere anecdotes, some are romances in miniature, some are serious, some comic; all are written in a light, smooth, conversational style. Four novelas are perhaps of less interest than the rest: El Amante Liberal, La Señora Cornelia, Las Dos Doncellas, and La Española Inglesa. The theme common to these is basically the traditional one of the Byzantine novel: pairs of lovers separated by lamentable and complicated happenings are finally reunited and find the happiness they have longed for. The heroines are all of most perfect beauty and of sublime morality; they and their lovers are capable of the highest sacrifices; and they exert their souls in the effort to elevate themselves to the ideal of moral and aristocratic distinction which illuminates their lives. In El Amante Liberal, to cite an example, the beautiful Leonisa and her lover Ricardo are carried off by Turkish pirates. Both fight against serious material and moral dangers. Ricardo conquers all obstacles, returns to his homeland with Leonisa, and is ready to renounce his passion and to hand Leonisa over to her former lover in an outburst of generosity; but Leonisa's preference naturally settles on Ricardo in the end. Another group of "exemplary" novels is formed by La Fuerza de la Sangre, La Ilustre Fregona, La Gitanilla, and El Celoso Extremeño. The first three offer examples of love and adventure happily resolved, while the last unravels itself tragically. Its plot deals with the old Felipe Carrizales, who, after traveling widely and becoming rich in America, decides to marry, taking all the precautions necessary to forestall being deceived. He weds a very young girl - and isolates her from the world, by having her live in a house with no windows facing the street. But in spite of his defensive measures, a bold youth succeeds in penetrating the fortress of conjugal honour; and one day Carrizales surprises his wife in the arms of her seducer. Surprisingly enough he pardons the adulterers, recognizing that he is more to blame than they, and dies of sorrow over the grievous error he has committed. Cervantes here deviated from literary tradition, which demanded the death of the adulterers; but he transformed the punishment inspired, or rather required, by the social ideal of honour into a criticism of the responsibility of the individual. Rinconete y Cortadillo, El Casamiento Engañoso, El Licenciado Vidriera, and El Coloquio de los Perros, four works of art which are concerned more with the personalities of the characters who figure in them than with the subject matter, form the final group of these stories. The protagonists are, respectively, two young vagabonds, Rincón and Cortado, Lieutenant Campuzano, a student - Tomás Rodaja (who goes mad and believes himself to have been changed into a witty man of glass, offering Cervantes the opportunity to make profound observations) and finally two dogs, Cipión and Berganza, whose wandering existence serves to mirror the most varied aspects of Spanish life. El colloquio de los perros features even more sardonic observations on the Spanish society of the time. Rinconete y Cortadillo is one of the most delightful of Cervantes' works. Its two young vagabonds come to Seville, attracted by the riches and disorder that the sixteenth-century commerce with the Americas had brought to that metropolis. There they come into contact with a brotherhood of thieves, the Thieves' Guild, led by the unforgettable Monipodio, whose house is the headquarters of the Sevillian underworld. Under the bright Andalusian sky, people and objects take form with the brilliance and subtle drama of a Velázquez. A distant and discreet irony endows the figures, insignificant in themselves, as they move within a ritual pomp that is in sharp contrast with their morally deflated lives. The solemn ritual of this band of ruffians is all the more comic for being presented in Cervantes' drily humorous style. Cervantes finished the romance of Persiles and Sigismunda, shortly before his death. The idea of this romance was not new and Cervantes appears to imitate Heliodorus. The work is a romantic description of travels, both by sea and land. Real and fabulous geography and history are mixed together; and in the second half of the romance the scene is transferred to Spain and Italy. Some of his poems are found in La Galatea. He also wrote Dos Canciones à la Armada Invencible. His best work however is found in the sonnets, particularly Al Túmulo del Rey Felipe en Sevilla. Among his most important poems, Canto de Calíope, Epístola a Mateo Vázquez, and the Viaje del Parnaso (Journey to Parnassus - 1614) stand out. The latter is his most ambitious work in verse, an allegory which consists largely of reviews of contemporary poets. Compared to his ability as a novelist, Cervantes is often considered a mediocre poet, although he himself always harbored a hope that he would be recognized for having poetic gifts. The prose of the Galatea, which is in other respects so beautiful, is occasionally overloaded with epithet. Cervantes displays a totally different kind of poetic talent in the Viaje del Parnaso, a work which cannot properly be ranked in any particular class of literary composition, but which, next to Don Quixote, is considered by a few the most exquisite production of its author. Many critics, however, would argue with that, citing the Novelas Ejemplares and the Entemeses as the finest examples of his work next to Don Quixote. Pedro de Urdemalas (1615), a sensitive play about a picaro, who joins a group of Gypsies for love of a girl. La Cueva de Salamanca, and El Viejo Celoso (The Jealous Old Man). Cervantes was entitled to consider himself endowed with a genius for dramatic poetry; but he could not preserve his independence in the conflict that he had to maintain with the Spanish public, who required certain conditions of dramatic composition; and when he sacrificed his independence, and submitted to rules imposed by others, his invention and language were reduced to the level of a poet of inferior talent. The intrigues, adventures, and surprises, which in that age characterized the Spanish drama (and which, we may assume, characterize all drama in every age) were ill suited to the genius of Cervantes. His natural style was too profound and precise to be reconciled to fantastical ideas, expressed in irregular verse; but he was Spanish enough to be gratified with dramas which as a poet he could not imitate; and he imagined himself capable of imitating them, because he would have shone in another species of dramatic composition had the public taste accommodated itself to his genius. Cervantes invented, along with the subject of his piece, a peculiar style of tragic composition; and, in doing so, he did not pay much regard to the theory of Aristotle. His object was to produce a piece full of tragic situations, combined with the charm of the marvellous. In order to accomplish this goal, Cervantes relied heavily on allegory and on mythological elements. The tragedy is written in conformity with no rules, save those which the author prescribed for himself, for he felt no inclination to imitate the Greek forms. The play is divided into four acts, jornadas; and no chorus is introduced. The dialogue is sometimes in tercets, and sometimes in redondillas, and for the most part in octaves - without any regard to rule. Unless indicated otherwise, the text in this article is either based on Wikipedia article "Miguel de Cervantes" or another language Wikipedia page thereof used under the terms of the GNU Free Documentation License; or on original research by Jahsonic and friends. See Art and Popular Culture's copyright notice. This page was last modified 17:04, 11 November 2013.